I was first exposed to the world of martial arts at the ripe age of five. I practiced BJJ for three years in the country in which the art was born. Although I don’t remember much of the training itself, it was there in Brazil that I became a huge fan of martial arts. When I moved to Paris at the age of eight, I began learning Atemi Jujitsu at the Daniel Pariset school. For ten years I practiced this Japanese Martial art. It is there that I developed an advanced instinctual understanding of human movement. The striking, locking, throwing, and rolling that I learned there became the roots of the knowledge and skills I have developed and continue to develop today. It was in the same school that I started boxing and kickboxing. This was a new experience for me as it finally inspired me to start questioning some of the techniques I had been taught. Sure, they felt right in training, but could I actually catch a punch by the wrist and apply a lock before the hand was retracted? I had very little experience of other martial arts. Although on a memorable occasion I got the opportunity to have one day of training with Shaolin monks that had come over for the annual Paris Martial Arts Festival. Having my legs kicked wider apart into the splits by an orange robe wearing monk who only spoke Chinese was a strange experience, one that I’ll never forget. Nevertheless, having done mostly Japanese based martial arts, I left France to go to Edinburgh to study at university with a closed mind and a very misguided notion of what martial arts actually are. In Edinburgh I struggled to find a place to train the first year, never being satisfied with the schools and university clubs. After a year I finally joined a small school, Zen Treasures, to start learning Kung Fu, under Sifu Mark Appleford. At first I was skeptical, but learning Kung Fu had been a lifelong dream so I stuck with it. It was in fact a great decision. As I became a part of the Kungfu family, Sifu started teaching me other arts in his own time. As it turns out, he traveled around the world and also explored several martial arts. With him I started to learn Chi Kung, Tai Chi and Kali. Sifu has also acted as a mentor, helping me find my way during difficult times by making me ask the right questions and helping me become aware of myself and my environment, both internally and externally. Even when I leave this great city I will continue to train what he has taught me and hopefully meet up with him occasionally to train together. Around three years ago I literally stumbled into a Krav Maga class. 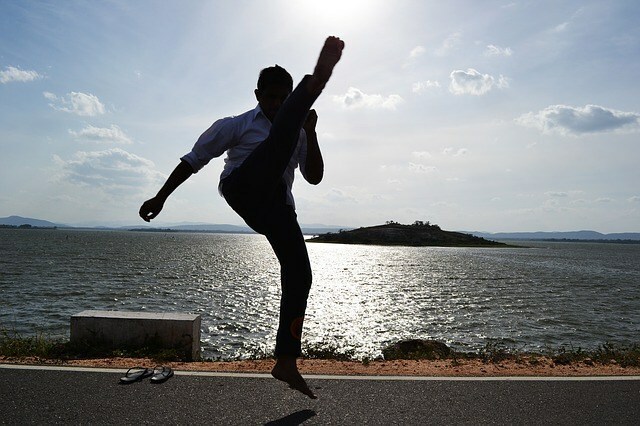 At the time, I had made the decision to stick to martial arts only, as opposed to practical combative practices such as Krav Maga, although I knew that I would want to train in them eventually. I had already taken a few classes with different instructors in Krav Maga and Tactical Edge, but nothing had actually hooked me in. This time however, I decided to try it. As it turns out, the instructor, Derek, was at a whole new level. He was energetic, efficient and taught well. His classes were based on consolidating functional techniques only and teaching tactics that he felt were useful. A lot of the time that meant going against the association that had qualified him to teach. He eventually left them and simply added another Krav Maga instructor qualification to the countless others he had already obtained, including some from Combat Krav Maga. When his classes moved to Headhunters Muay Thai gym, I decided to try that out too. It was exhilarating and a great workout but the damage my body sustained was too much and I eventually stopped doing Muay Thai. One weekend Derek invited Lior Offenbach to teach a weekend seminar. During that weekend I acquired bruises, fatigue, several grade 1 tendon injuries, and a whole new dedication to the system. Derek offhandedly suggested one day that I should do a Krav Maga instructor course, and so I did. I traveled to Spain to do a week-long course with IMKM. There I learnt valuable skills required to teach Krav Maga. After that I assisted in Derek’s classes as well as began teaching my own classes at a separate location. Three years after starting, I’m so glad I decided to join that class I had stumbled upon. Krav Maga has given me a whole new perspective in the approach of learning how to apply training to real life situations. I have met a great many people and came across a great many arts. I tried out Wing Chun, Ninjutsu, Karate, Jujitsu, Judo, and Tae Kwon Do to name a few. I met amateurs who were self-proclaimed masters, and humble masters who were self-proclaimed students. I learned quite a lot in that time. I’ve discovered that what martial art you do ultimately doesn’t truly matter. What matters is how you train them and the intention you have for them. What also matters is who teaches them to you and what they claim the benefits are. I have met a few self defence instructors who taught bizarre techniques and training drills, I have also met martial artists who train for the sake of the art itself and who could very easily take care of themselves. Sifu Mark for instance, sends students who want to learn to defend themselves to other schools. However, having sparred with him I know that the way he has trained and the skills he has acquired are so advanced that he could apply them in real combat. I have also learned that training yourself internally is just as important as externally. Learning how to breathe, how to maintain awareness and how to guide your emotions in training and in everyday life will result in a much more pleasurable and satisfying practice of the arts. Every martial art has something to teach you, whether you train to become a fighter, to defend yourself, or just because you enjoy the arts. The Chinese martial arts have taught me how to increase my awareness and how to redirect energy, as well as the internal aspects of martial arts. Krav Maga has taught me how to adapt movements you have learned to make them work, not just look pretty. Kickboxing has taught me that it’s okay to train just for a good workout and to socialise with other people. Most importantly, I have learned that it’s vital to keep an open mind about the arts and its practitioners. Of course, there is a lot of rubbish out there, but ultimately it’s important to differentiate “rubbish” from “different,” as they are not the same. Although I have 19 years of experience in martial arts, I am young and have much to learn. I do believe that the lessons outlined above are essential to be able to develop as a martial artist. Having only fully understood these recently, I believe I’m still in the very early stages of learning how to be a real martial arts and combatives expert. Skip 19 years of wasted effort and take what is in this article to heart.